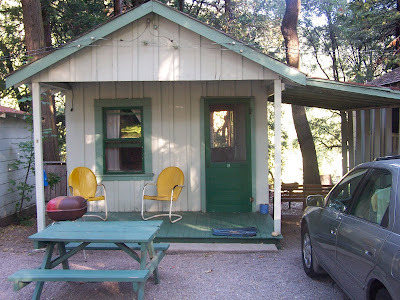 Cave Springs Resort -- What They Don't Tell You and Why It's Only $50/night. This is our "home" in Mt. 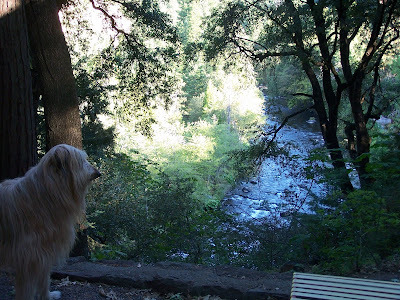 Shasta at the Cave Springs Resort. It has its sweetness, but we can't get out of here soon enough. We leave tomorrow, two days early. There is NO air conditioning! And they don't tell you that they are 350 feet from the interstate -- and near a curve too, so the nearby trucks downshift all night long. This is the screen door off the tiny little kitchen (so small that the fridge is outside). You can see the river running below out there. The river is really beautiful and FULL of trout! The fishermen are everywhere fly fishing here! 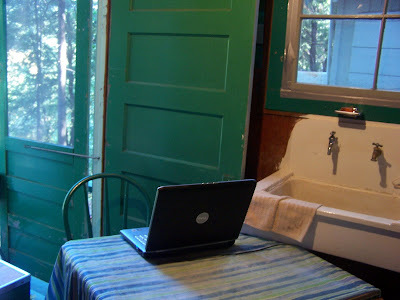 By the way, there are only two outlets in the whole cabin and they are near the kitchen sink, so she had to set up our office in the kitchen. 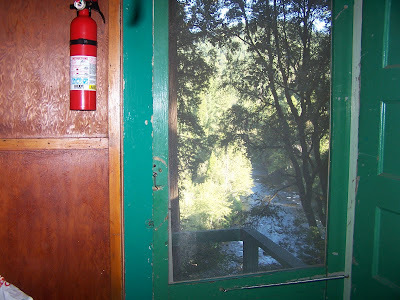 It's pretty cool really (hot temperature-wise but cool otherwise); the Sacramento River runs behind the cabin. We get the fresh air but the roaring river is REALLY LOUD. It sounds like a GIANT FAN RUNNING ALL THE TIME. But it helps to drown out all that traffic noise coming from the front. But oh dear! The railroad runs along the river too -- so a dozen times per day (and night!) the trains come through -- slowing down around the curve long enough to blast their horn and wake us from our slumber! But that's OK. We are so lucky to be traveling and seeing new things! We'll sleep one more night on a mattress that must be about 40 years old and we'll be on our way tomorrow. See you whenever we get where we're going!